"I didn't really have any lox slicing credentials." Len Berk loves lox, the salt-cured salmon that goes so well with bagels. 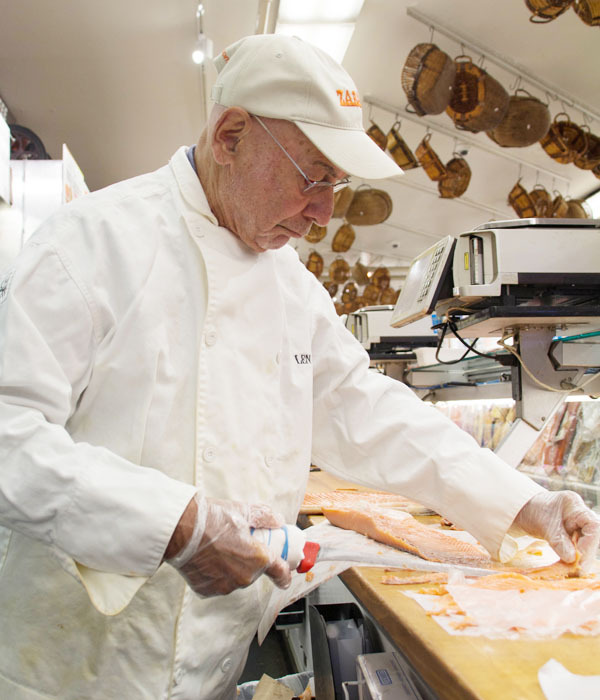 Today, the 85-year-old New Yorker is a veteran salmon slicer at Zabar’s, a gourmet food shop in Manhattan. But it wasn’t always that way. At StoryCorps, Len (pictured at left slicing lox at Zabar’s) tells his friend Joshua Gubitz (above left) about becoming a salmon slicer after forty years in accounting. Originally aired June 5, 2015, on NPR’s Morning Edition. ”Fives” by Podington Bear from the album The Sound of Picture Production Library! LB: I never loved it, but accounting provided a decent living, and it was very important for me to take care of my children. So after I retired I looked for something to do next. I got a telephone call from a friend of mine who said that she saw an advertisement in the New York Times that a large gourmet food store was looking for a lox slicer, and I thought I could do that. I had been a customer of that store for many years and I used to buy chunks of salmon and take it home and slice them myself because I’ve always enjoyed slicing salmon. So I applied for the job. I sent the owner an email listing ten credentials, uh, I’ve been one of your best customers; I’m reliable; I’ve always been a fish person. JG: You actually listed these as credentials? JG: And what makes you want to be nice to those people? LB: Well I no longer want to be nice to them. JG: Why mess with a good thing? LB: Yeah. I’m working toward the perfect slice.